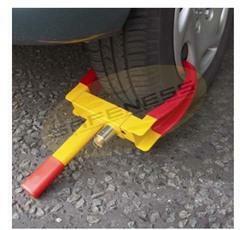 Wheel Clamp is used to prevent vehicles from being moved and is designed to fit almost all size wheels. Soft coated clamp will not scratch or damage wheels or rims. 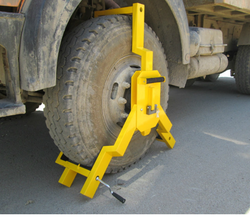 This wheel lock is easy to fit and the jaws of the clamp open up to pass over the tyre then close and lock around the wheel rim. They are highly visible due to bright colors (red & yellow). We have over two decades of vast industrial knowledge and experience in producing superior quality Wheel Stopper. Our engineers and technical team also provide customised designs Wheel Clamps as per customer requirements and applications. Advanced techniques are used to produce Adjustable Wheel Clamp with precision. Resistance Tearing, abrasion, ozone weathering, etc. It is having Curved surface contours to fit tires. Its Rubber provides resistance against tearing, abrasion, ozone weathering, etc. Its functional design is durable in all weather conditions. 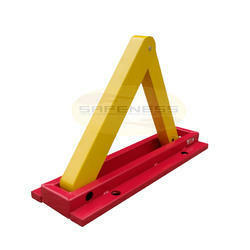 The wheel clamp is ideal for heavy vehicles like Buses, Trailers, Lorries, Earth moving & other heavily loaded vehicles. The basic materials used in manufacturing Wheel Lock with PVC fork are well tested by our testing team to ensure its safety. Our engineers and technical team also provide customised designs Wheel Locks as per customer requirements and applications. We have marked a distinct position in the market by providing high quality Parking Space Lock. Offered Wheel Locks are made available for the clients in diversified specifications as per their demands. It is manufactured using the finest quality raw material and sophisticated technology. We assure our customers that these products are checked at each stage of production process. Looking for Wheel Clamps ?